Insulrap - Telstar Hydraulics Ltd.
Telstar INSULRAP has gone through many stages since we did our first ST7.5. Our first machines were done using three basic components. T-Braid-2, PT-5 and Pyrosil Tape. 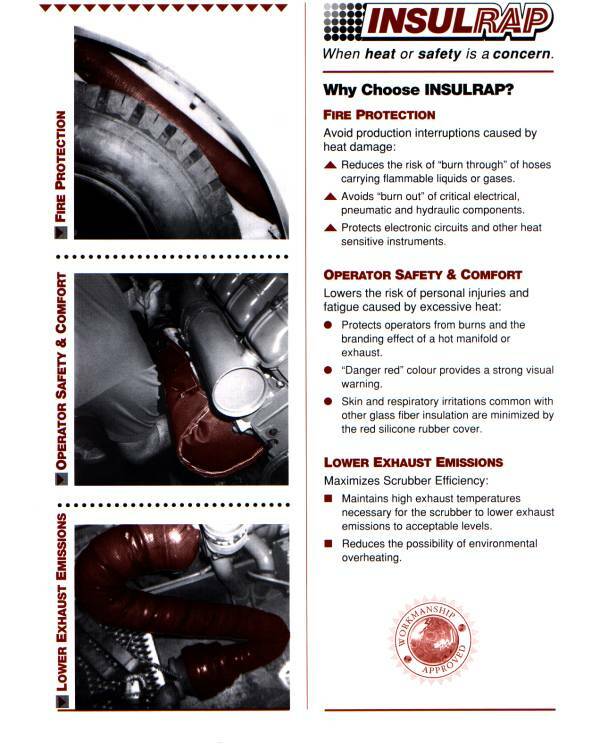 We would start by wrapping the complete exhaust in a spiral direction butting edge to edge with T-Braid-2. We would secure it at both ends with mechanics wire. We would then wrap over top with PT-5. Once again we would wrap in a spiral direction butting the material edge to edge as much as possible. 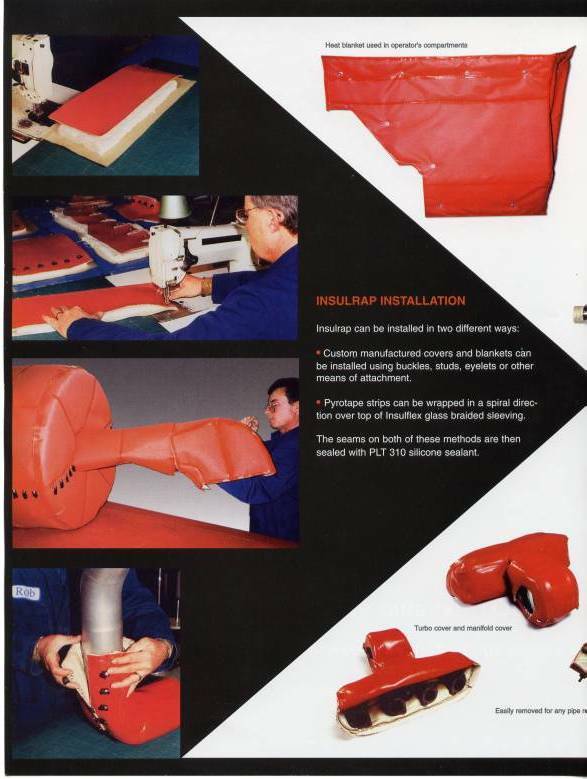 Next we would temporarily secure the PT-5 in place using the Pyrosil-Tape. Once everything was in place we would take a damp rag and wipe down the entire exhaust system. The reason for wiping the system down is as follows. Pyrosil-Tape is a silicone based tape that is the same as the coating on the PT-5. There is no adhesive on this tape and we rely on it to bond to itself. It is for this reason that we must ensure that the surface of the PT-5 is as clean and free of lint as possible. Finally, we would make a couple of wraps around the beginning of the PT-5 and then follow the seam in the same spiral direction as before. We would remove the protective cellulose and stretch the tape as we smooth it in place. We finish up at the end as we started by making a couple of wraps around the PT-5. We take care not to apply the Pyrosil-Tape directly to the bare exhaust as it has a much lower flash point than the other materials. During this period of time, we would also make up a manifold boot for use on Deutz engines. In some cases, we would wrap them in the same ways as the rest of the exhaust. For the eight, ten and twelve cylinder engines, we would make up this boot. We would use a light weight silicone coated glass fiber material as an outer layer. We combined this with a 1″ glass fiber matting and a stainless steel mesh liner. These three products were then stitched into a boot that could be slipped onto the manifold and held in place with a wire fed through a series of grommets. This procedure remains the same to this date. As new materials became available, we were able to change our methods. With the introduction of Pyro-Jacket-XL we were able to cover straight lengths of pipe as well as mufflers, silencers and purifiers with a single sheet of material. Since Pyro-Jacket-XL comes in a roll 40″ wide, we were able to cover some very large pieces. At this time, we started covering the exhaust components with 1″ Insulmat (a 1″ thick glass fiber blanket) and temporarily securing it in place with mechanics wire. We would put hooks on the Pyro-Jacket-XL and we would lace the cover over the exhaust as you would lace a skate. The PT-5 would be used only to cover the elbows of the system and we would seal the joints and seams once again with the PST-24 (Pyrosil-Tape). There was however, one drawback, to the use of the hooks. There was the potential for someone to injure themselves on the exposed hooks. For this reason, we went to eyelets and started lacing the cover as you would a boot. This system worked very well, but I was not satisfied. I searched until I found a buckle that we could put on the Pyro-Jacket-XL that would be easy to buckle and unbuckle. It also had to give us a bit of adjustment because of variances in material sizes as well as the placement of clamps, etc. Up until a couple of months ago, this was the best system that we could provide. It went together fairly easily and provided a way that the end user could take it apart to make repairs and put it back together with a minimal cost. We did not stop there, however. We felt that there was still room for improvement and we started looking back at the boots that we were making for the manifolds. At this point, we went to the people who were stitching the boots for us, and had them make up a blanket for us with Pyro-Jacket-XL, Insulmat, the Stainless wire mesh and the buckles. This worked well enough that we went out and bought an industrial sewing machine. We are now doing blankets for straight lengths of pipe, as well as covers for purifiers and mufflers. Whenever possible, we also make covers for the elbows. We currently use a high heat silica cloth as a liner instead of the stainless wire mesh. It is easier for us to sew, have less waste, and we will not have the random wire barbs protruding through the surface of the cover. This happens as a result of the needle hitting the wire, and pushing it through with the thread.